Since today is National Cheese Fondue Day, I decided to stand up against the lack of fondue in my life and put together a delicious recipe. I went with beer cheese fondue because, well, beer! I recommend using a lager. I chose Omission Beer, which is made in Oregon. The cheese is a mixture of sharp cheddar and gruyere, very flavorful and creamy. What you’re going to dip in that delicious cheese is equally as important as the cheese itself. You know we hate boring food, so we went with a lineup we felt was on our level: bacon wrapped chicken bites, pigs in a blanket, homemade potato chips, homemade mini soft pretzels, rye crisps, and also some apples to keep it classic. Janette did an awesome job making the mini pretzels. 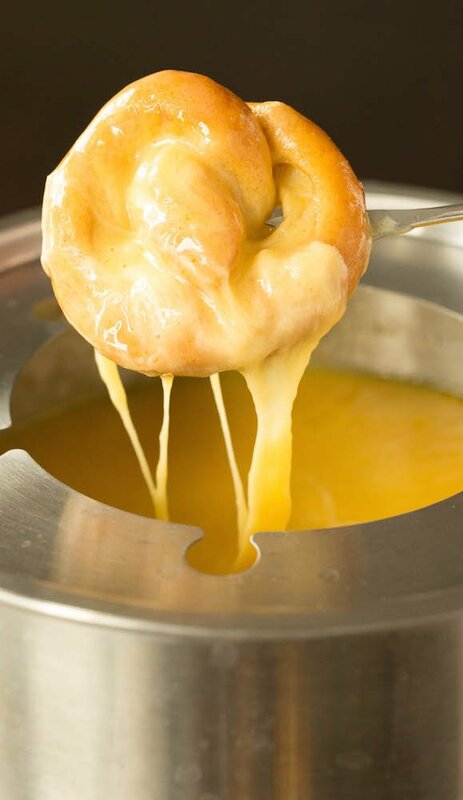 They were one of my favorite things to dip in the fondue. It’s like getting a soft pretzel at a ball game but made with love and served with gourmet cheese. 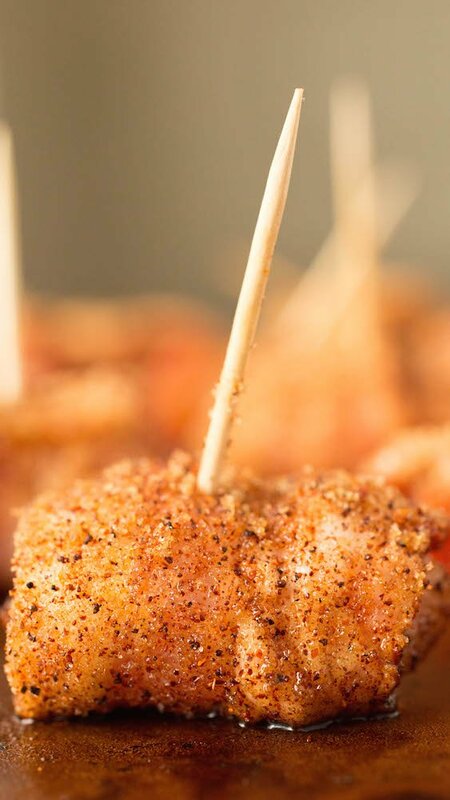 I made the chicken bacon bites, which is chicken breast wrapped in bacon, then covered in brown sugar and chili powder. Um, YUM! 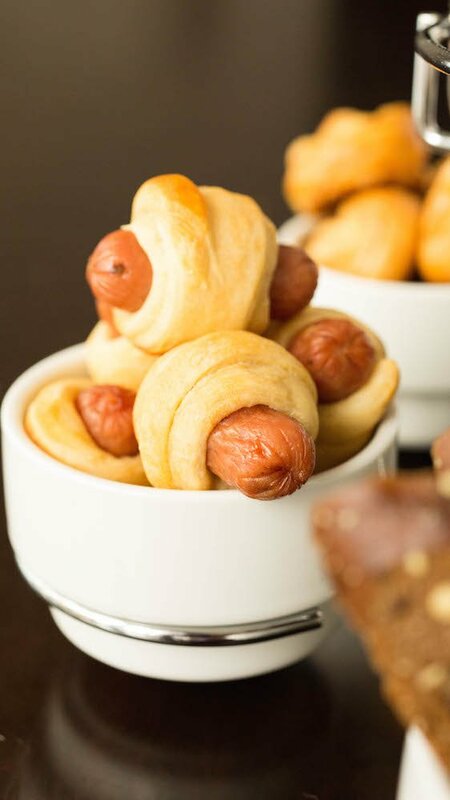 Who doesn’t love pigs in a blanket? I made these with mini chicken apple sausages and Immaculate brand crescent rolls (they don’t use preservatives, bleached flour, or hydrogenated oil). The homemade potato chips may have been my favorite thing to dunk in the cheese. They were really crispy and we seasoned them with a little salt and garlic powder, which wasn’t overwhelming but gave them a little “oomph”. I was going to make my own giant croutons, but then I remembered about Just Off Melrose. My local grocery store carries their croutons and crisps. These looked so good I decided to just go ahead and buy them. 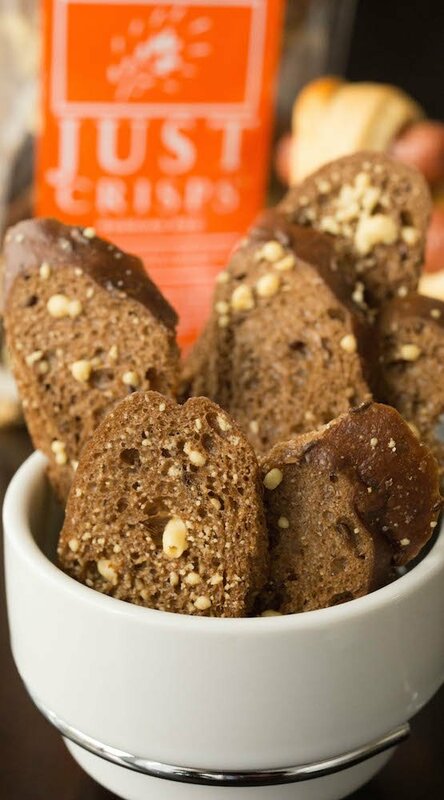 If you don’t care for rye, try pumpernickel. I think it would go great with the cheddar fondue. That concludes our beer cheese fondue spread. We were quite stuffed at the end of the day! 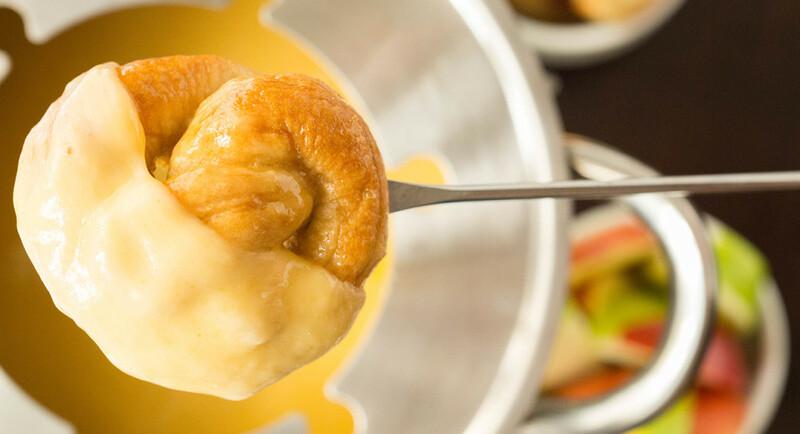 Here’s to hoping everyone has a fantastic National Cheese Fondue Day! Cut the garlic in half. Rub the cut ends all around the bottom and sides of the pot. 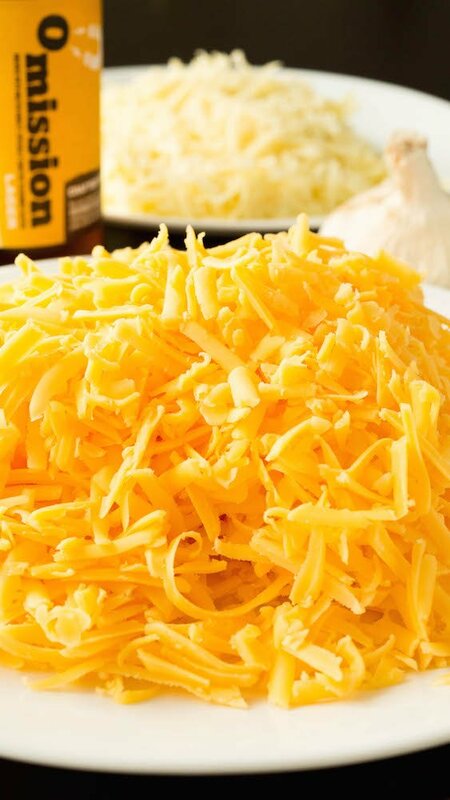 In a large bowl, combine shredded cheeses, salt, white pepper, and flour. Add beer to a saucepan and bring to a bubble over medium heat. Reduce to a simmer and then begin adding the cheese, one handful at a time, stirring constantly with a wooden spoon. 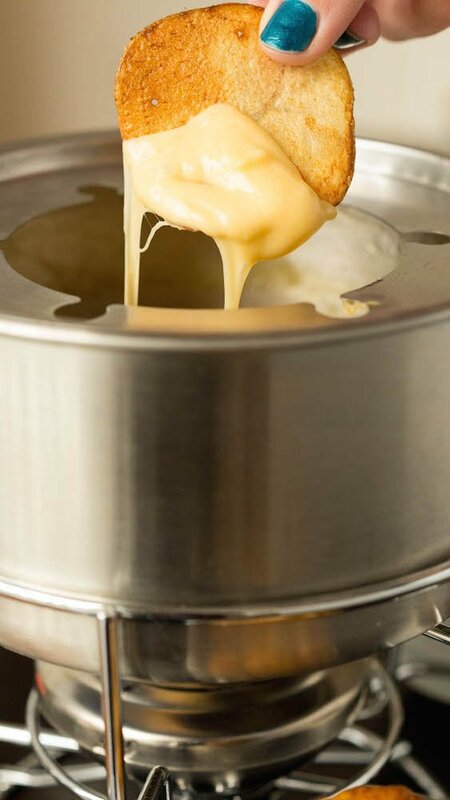 When all the cheese is fully melted, transfer to your fondue pot and serve. Mix together the warm water and 1/2 tablespoon sugar in the bowl of an electric mixer. Sprinkle with the yeast and let sit for 10 min. (yeast should foam up). Add 1 cup of flour to yeast, and mix together on low until combined. Add the salt and 1 and a half more cups of flour. Beat on medium low until the dough pulls away from the sides of the bowl. Add the last 1/2 cup of flour and knead on low for 5 min. or so. (If the dough still seems wet and sticky add another 1/2 cup of flour). Transfer the dough into a large bowl coated in the oil. Turn the dough to cover all sides with the oil as well. Cover with a towel and leave in a warm place for 1 hour. The dough should double in size. Heat the oven to 450 degrees. Lightly spray a baking sheet or two (depending on how big your sheets are. I have once giant one) with cooking spray or cover with parchment paper. Punch down the dough and transfer to a lightly floured board. Knead once or twice and divide into 32 pieces (These pretzels once cooked were about 1 1/2 – 2 inches wide). Wrap in plastic. Roll one piece of dough at a time into a 10-12 in strip. Twist into a pretzel shape and transfer to the prepared baking sheets. Cover with a towel and continue to form all pretzels. Let pretzels rest until they rise slightly, about 10-15 min. Fill a large, shallow pot or saucepan with 2 inches of water. Bring to a boil. Add baking soda (be careful, it foams up quickly) and 1 tablespoon sugar. Reduce to simmer and place 4-6 pretzels in the water. Poach 1 minute on each side and place back on the baking sheet. Repeat process for all pretzels. Beat 1 egg with 1 tablespoon water and brush each pretzel with a bit of the glaze. Sprinkle with coarse salt and bake for 10-12 min or until golden brown. Let cool on wire rack. Eat warm or keep at room temperature for a couple days. Cut each slice of bacon into thirds and wrap around the chicken breast cubes. Secure with a wooden toothpick. Combine brown sugar and chili powder in a small bowl. Dredge bacon wrapped chicken in the mixture. Place chicken on a baking sheet or stone that has been coated in non-stick spray. Bake at 350° for 30-35 minutes, until bacon is crispy. Preheat your deep fryer or some oil in a pan to 325°. Slice the potato at the thinnest setting on a mandolin slicer. Drop the potatoes in the oil and cook for a few minutes until crispy. Transfer to a paper bag filled with the salt and garlic powder. Shake until chips are coated. Cut each crescent roll into narrow thirds. Wrap each third around one sausage. Place on a baking sheet or stone and cook for 12-15 minutes, until crescents are beginning to turn light brown. Oh, you’re making me hungry. This looks very tempting. I couldn’t find gruyer cheese, so checked the net for a substitute and used gouda..that was probably my problem… The fondue was really grainy..but thecfkavors were good.